Do not be so surprised! All news, science, life, personal relationships, you name it, can be had in a virtual world in front of a computer. "Kids should have adult supervision with using electricity, then they won't do it wrong!" "How will we learn about electricity?" "I'm a good Cub Scout, I know what to do- wash your hands, don't chew on stuff you don't know what they are." And my kids are NINE and ELEVEN years old. Kids who are raised to understand that the world is risky know what the proper precautions are, and will take them. Their friends who are raised in an atmosphere of prohibition will come over to our house and touch everything indiscriminately because they've never experienced getting hurt by exploring and don't know it's possible. When we have science club meetings, we have to teach them what not to do for safety. I wish Congresspeople six times their age had half the sense my kids have got in their heads. 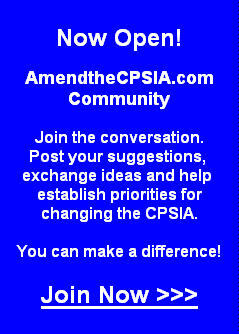 I've been fighting the CPSIA since I knew about it. Due to health reasons, I can't fight as aggresively now. For four months my business shut down, waiting to see if saner minds would prevail (sanity - congress, oxymoron? If con is the opposite of pro, is congress the opposite of progress?) Finally someone said ordinary books printed after 1985 were safe. *scratches head* I wonder how many books printed before that time have to be eaten to harm a child? It's too bad no one told the mice in our house that the insulation they ate off a 220 cord in the wall was poisonous. There is definitely no end in sight to the disasters being caused by this toxic law! Used Science items, among many other items, are gone from the shelves of my store...Along with pretty much any other used hands-on products. One of my customers has a very expensive science kit she is done with -- now she can't safely sell it -- punishing her, and those who would be happy to buy it from her. It's just as safe now as it was a year ago, but we don't expect Congress to understand that! Contempt for Congress is the only reasonable response. When I was in elementary school, we made model Eskimo igloos and Pygmy huts by taking a big of powdered asbestos and mixing it with to water to create a malleable surface that would harden when dry, somewhat like modeling clay. When the teacher was out of the room we roll it into little balls and shoot them at each other through straws used as pea shooters. Don't even ask about what we did the big jar of mercury I used to make a homemade barometer! I think we need to update the dat on lethal dosages for lead and other toxins by force feeding them to congress until they all die. We will then have useful data, and end the harmful effect of congress. The simple thing to do of course is to require the use of recycled vinyl for wire insulation so that it is no longer possible to obey the law. Dammed if you do dammed if you don't. Thank you for your blog! I have bookmarked it and will forward the link to others. So very well written!